As an artist myself, sharing other artists means so very much to me. And today I am soooo excited to share this beautiful artist with you!! When this precious portrait of our fam came in the mail I literally gasped.... what a beautiful, completely priceless gift that I will cherish forever. Cannot wait for THREE of you to win!!! eeep! 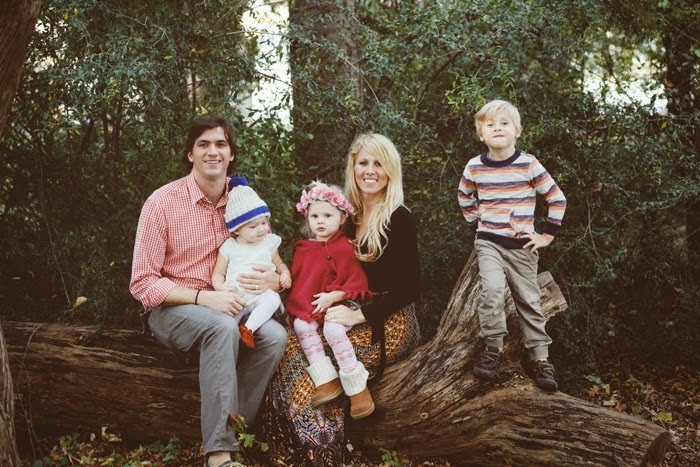 "My name is Katie Muncie, I'm a 32 year old wife and mother of two ages 6 and 8. When asked to describe myself I like to describe my passions which are painting, crafting, cooking and to be surrounded by beautiful things. I am artistic soul who adores having a colorful messy life. Originally from Australia I moved to Hawaii when I was seventeen years old, to live with my sister, and undertake a Graphic Design apprenticeship. I never left, married a kite surfing obsessed California boy, made two very naughty babies with him and continue to be addicted to this island paradise. Fifteen years in paradise is not enough, I'm hoping for another fifteen. Six years ago I was diagnosed with a terminal disease called Scleroderma. The disease quickly ravaged my me causing lung fibrosis and handicapped my body in various ways, my prognosis was either 6 months or 10 years. It was during those long days, chemotherapy infusions and stem cell transplants, that I really took to painting. 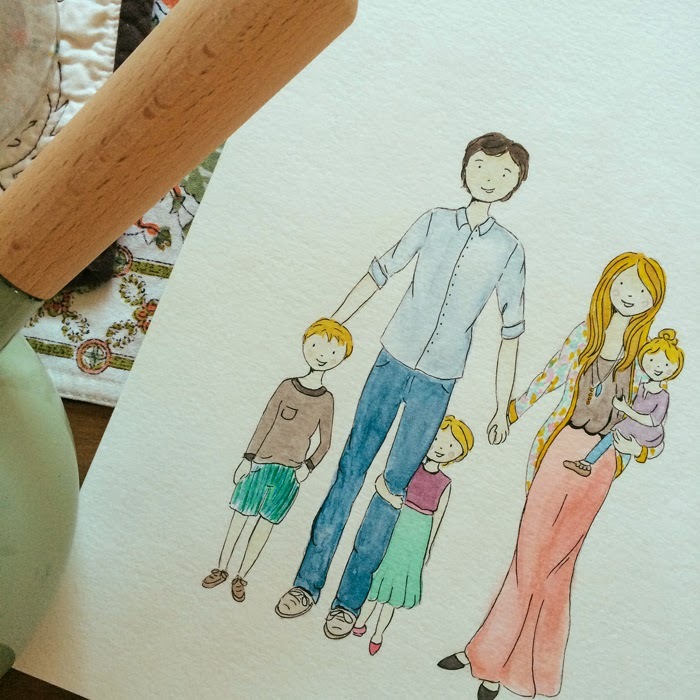 I started painting portraits to create family keepsakes and as a way to remember milestones in my kids lives. Memories, and preserving them, had become more important to me. Fastforward to last year and I asked a few friends and family if they would like portraits, well that was a mistake because I have a huge family (massive really!) and they all wanted one! It was so much fun though and it changed my year and brought a sparkle into my life to have this creative outlet. 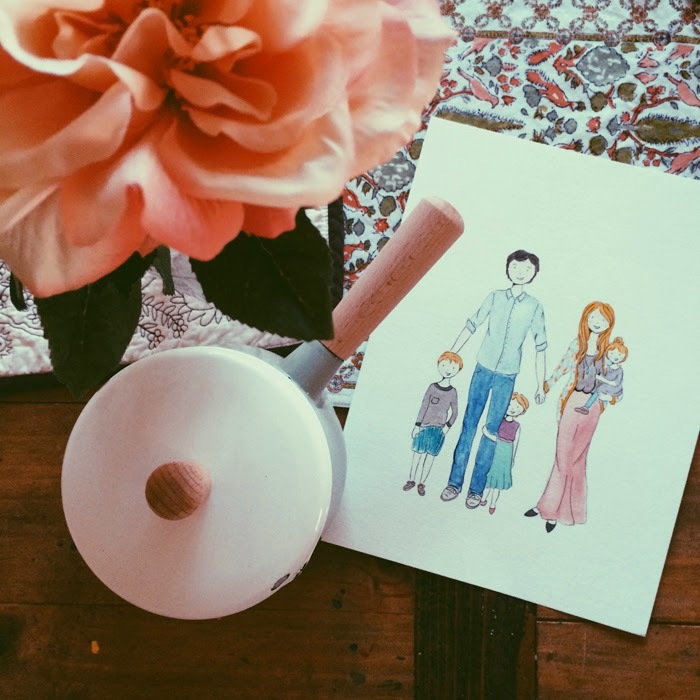 Seeing the joy that painting for others brought to me my husband finally gave me the impetus to make my pleasure a business 'Just go for it, stop being afraid!' sometimes we just need to hear the reassurance that our dreams are valid and worth pursueing. I think as moms we often forget that not only are we allowed to dream but that we should! Seeing the slow but steady growth of my tiny baby business has blown me away. After being diagnosed and essentially told that there would be no more dreams, to be sitting here five years later, dreaming again. My heart is full. I am on a journey, a journey of living in a broken body with a heart full of my dreams. My business is really just me, my paints, a good cup of tea and two crazy kids making a whole lot of noise. I know it sounds a bit cliqhe but between days spent at the beach and our homeschooling lessons you will find me filling every gap in our day with painting and arts. 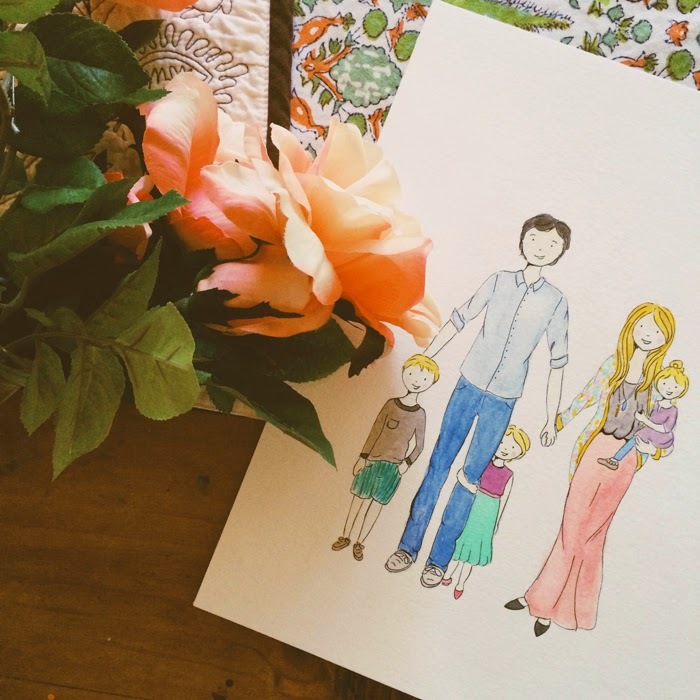 Watercolor portraits are perfect for not only family memoris but also special occasions like weddings, first day of school, graduation, engagements, Christmas cards and just because. A fun aspect of these portraits is when your extended families cannot be in the same state (or country!) I can combine everyone into one portrait for an adorable family reunion. 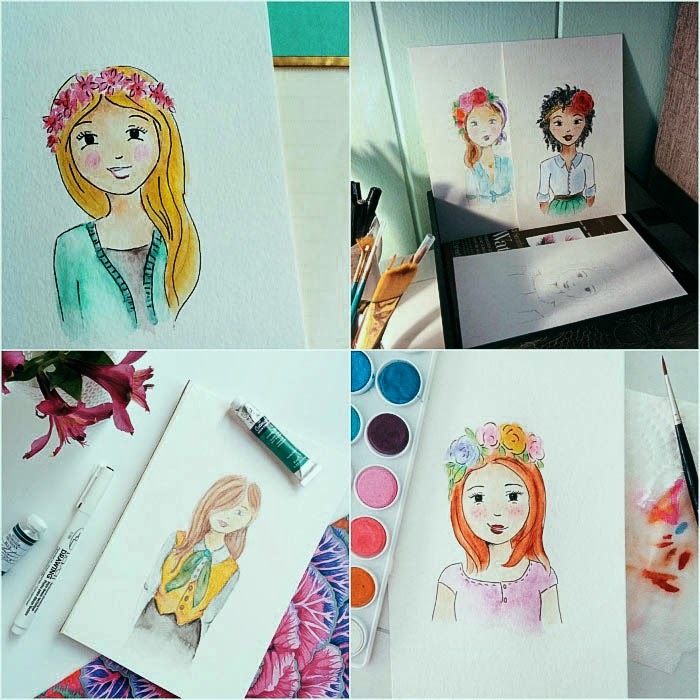 I paint all my portraits on 140 pound cold press watercolor papers so they wont fade and will last a lifetime. I use pencil to sketch the outline then paint with archival professional quality watercolors, to give that beautiful soft whimsical look, and finished with a fine pen for definition. Finished size is 9 x 12 inch unframed. I am happy to accomodate custom sizes. Pricing starts at $65 for 1 person portrait. Each additional person or pet is $20 each. You can order as many people as you desire." Giveaway will be for three standing family portraits valued at $165 each. Winner will be announced on Katie's instagram. Giveaway/sweepstakes rules: No purchase or payment necessary. Sweepstakes prize is listed above. By entering this sweepstakes, the entrant acknowledges that they are eligible for this sweepstakes according to all laws set forth by their home state. US residents only. Entrants who do not meet these criteria will be disqualified. Winner is liable for any taxes associated with the prize. The promotion period for this giveaway will close next week and a winner will be chosen via Rafflecopter. The winner will be contacted privately and CaseyLeigh may choose not to publish the winning entry on this site. Void where prohibited. Sweepstakes sponsored by katiemuncie.